Exclusive Charter Service is pleased to announce the newest addition to our fleet. 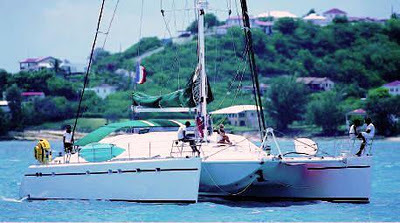 The 65' Catamaran Bonaventura built by Privilege. The exceptionally high standards of the Privilege shipyard shine through on this beautifully crafted catamaran. The award-winning birch wood interior is complemented by indulgent upholstery that creates an exclusive atmosphere for the experience of a lifetime. The deck surface encompasses a staggering 1500 square feet and could be comparable to having your own personal, floating, island paradise. The vast cockpit has two teak dining tables and is ideal for al fresco dining against a breathtaking backdrop. With sunbathing mattresses to soak up the rays, twin trampolines to while away the hours of a lazy afternoon on and stepped swim platforms for easy access to your favorite watersports, the open-air living space offers everything you might desire for the perfect getaway. Accommodating up to 10 guests, the interior living area is so spacious you could lose yourself in it. The open plan salon offers a light and airy environment where you can marvel at the spectacular scenery from luxurious, air-conditioned comfort. The catamaran boasts a separate dining table, cocktail lounge and generous bar space ; perfect for an evening of entertaining with friends new and old. The comfortable sofas combined with the extensive entertainment system means that whatever your mood, the salon is the perfect place to relax. Watch a movie, fill the air with your favorite melodies or retire to the bar, the choice is yours. The five, luxury, double air-conditioned cabins are located in their own private area of the catamaran and have excellent facilities including en suite bathroom, personal CD stereo system and private closet.